Living Area 4,229 Sq. ft.
Immaculate throughout! Shows like a model home! Featuring 4 bedrooms, 3 full baths this home has been lovingly maintained by its present owners. Step into a 2 story hardwood foyer w/turned staircase. 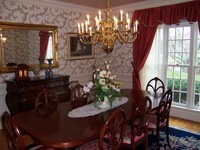 Formal living & dining rooms w/glistening hardwood floors & custom moldings. To the rear, step down to a 2 story family rm w/FPL & beamed ceiling. 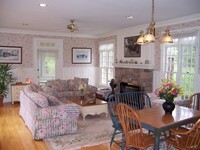 Custom library w/wainscot & access to full bath. 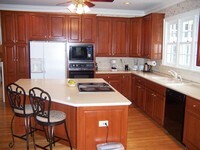 Kitchen features center island / brkfst bar, premium appliances & desk area. Brkfst rm opens to beautiful keeping room w/FPL, walls of windows & atrium door to custom decking. Access to screened in porch. Above are 4 bright & airy bedrooms including master suite w/luxurious bath. 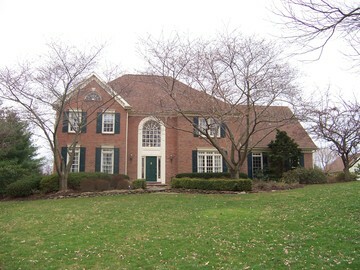 Below a finished basement, 2 car attached garage & 1 car detached garage. 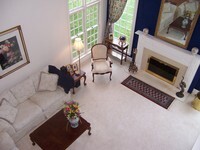 Professionally landscaped gardens complete this lovely home. Kitchen just completed - new renovation as of May, 2010.